The Shelter Valley Shape-Note Singers gather on an occasional basis (see our Coming events page for location details). We sing early American four-part harmony from The Sacred Harp, 1991 edition. All are welcome to join us, regardless of age, musical ability, or previous experience. Just turn up, and you'll be welcomed! Songbooks are provided. There is no cost to participate, though small donations toward refreshments, books, etc. are gladly accepted. To receive e-mail reminders of our regular and occasional singings, please sign up for our e-mail list using the form provided on our Contact page. Singings held on the third Wednesday of every month, 7:30-9:30 pm, in the Music Room of Bloor Street United Church at 300 Bloor Street West (near Huron). Singings held on the third Friday of every month, 7:00-9:00 pm. Location may vary - call/email to confirm. Singings held on alternate Saturdays, 2:00-4:00 pm, at 50 Second Street, Orangeville, L9W 2C1. Call/email for current schedule. 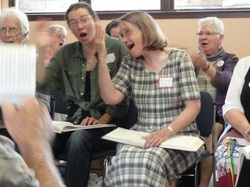 It's the 14th Annual Central Ontario All-Day Sacred Harp Singing with midday dinner on the grounds. The event runs from 9:30-3:30 at the Detweiler Meetinghouse in Waterloo Region. It is a traditional all-day singing, from the 1991 edition of The Sacred Harp. Loaner books are available. Bring food to share (no warming facilities available).